Church, Sarah and Irfôna Larkin. "Arts Commons". The Canadian Encyclopedia, 19 August 2015, Historica Canada. https://www.thecanadianencyclopedia.ca/en/article/epcor-centre-for-the-performing-arts. Accessed 25 April 2019. Arts Commons (formerly the EPCOR Centre for the Performing Arts and the Calgary Centre for Performing Arts) is the largest performing arts facility in Western Canada and one of the three largest in the country. Occupying a full city block on 8 Avenue in downtown Calgary’s cultural district, it houses five theatres and a large concert hall for a cumulative seating capacity of 3,682. The centre’s 560,665 square-foot space, spread over six levels, is home to eight resident companies that host more than 1,800 events each year, drawing almost 600,000 people annually. The centre was conceived in the 1970s in response to the need for improved performing spaces for Theatre Calgary, Alberta Theatre Projects and the Calgary Philharmonic Orchestra. A committee of the Calgary Region Arts Foundation, headed by Martha Cohen, instigated a feasibility study, which in 1976 confirmed this need. Cohen's committee eventually raised $11.3 million from the private sector and secured $2.5 million from the federal government, $48.7 million from the province of Alberta and $12.7 million from the City of Calgary. Work began in 1981 and the centre opened in 1985, built at a cost of $102.4 million. Municipal and provincial governments contributed to a fixed annual operating grant of $2.4 million. Raines Finlayson Barrett and Partners of Calgary were the architects, with Richard Pilbrow (UK) as design consultant, Theatre Projects Consultants Ltd. (London and New York) as theatre consultants, and Russell Johnson and Artec Consultants Ltd. of New York as the acousticians. The centre incorporates two heritage buildings — the Burns Building (ca. 1917) and the Calgary Public Building (ca. 1931) — with the site of the former Empress Theatre. Arts Commons is home to eight resident companies: Alberta Theatre Projects, the Calgary International Children's Festival, the Calgary Philharmonic Orchestra, the politically conscious Downstage theatre company, the Honens International Piano Competition, One Yellow Rabbit Performance Theatre, Theatre Calgary and the Wordfest literary festival. The centre has produced a variety of annual music, film and community series, and has been host to such regular series and events as the renowned BD&P World Music Series, the PCL Blues Series, the TD Jazz series and National Geographic Live. The centre was inaugurated on 14 September 1985 with a gala concert in the Jack Singer Concert Hall. The program consisted of orchestral and choral music, dance and drama, and featured the world premiere of Brian Macdonald's ballet for The Garden of the Heart by R. Murray Schafer, with Maureen Forrester as soloist. The Calgary Philharmonic celebrated the opening, and its own 30th anniversary, by performing Mahler's Symphony No. 8 on 18 and 19 September with more than 400 performers, including the Edmonton Symphony Orchestra, the Calgary Philharmonic Chorus, three Calgary children's choirs and eight soloists, under the baton of Mario Bernardi. During the centre’s first year of operation, each of the original resident organizations exceeded the centre's projected income and attendance. The Calgary Philharmonic concerts averaged 93 per cent capacity and a 60 per cent increase in revenue from ticket sales during that season. In 2006, the centre received two Steinway concert pianos, purchased with a $250,000 donation from F.R. Matthews. They were premiered in a September 2006 concert by pianist Roberto Plano and the Calgary Philharmonic Orchestra. The three largest performance spaces are named to honour outstanding Calgarians and their donations to the centre. Considered one of the finest acoustic halls in North America, the Jack Singer Concert Hall is the performance space for the Calgary Philharmonic Orchestra. It is named after a Calgary arts patron, whose family was a major donor. Designed as a sound chamber and modelled after the Musikvereinsaal of Vienna, the shoebox-shaped hall has 1,800 seats and 200 choir seats behind the orchestra. The acoustics can be modified by the laminated wood canopy that hangs over the stage, and by sound-absorbing curtains and banners. The Jack Singer Concert Hall also houses the magnificent 6,008-pipe Carthy organ built by Casavant Frères. It was purchased with a $750,000 donation from the Carthy Foundation of Calgary, in memory of Margaret Mannix. Designed for both solo recitals and works with full orchestra, it was first heard in concert on 6 May 1987, played by Simon Preston, with the Calgary Philharmonic under Bernardi. This gift inspired the organization of the Calgary International Organ Festival, first held in October 1990. 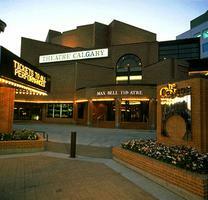 The 750-seat Max Bell Theatre was designed in conjunction with its resident tenant, Theatre Calgary. Its proscenium arch can be expanded from eight to twelve metres. The Max Bell Foundation donated $1 million to the centre. The 450-seat Martha Cohen Theatre, named in honour of the centre's founding president, also recognized a major donation of $1 million from the Cohen family. The theatre, with its tiered boxes, was designed jointly with its resident company, Alberta Theatre Projects, to be an intimate, flexible performing space. Since 1985, three new theatres have been added to the complex. The 185-seat Engineered Air Theatre, opened in 1994 on the site of the Empress Theatre, typically hosts small community performances, lectures and receptions. Portions of its interior, including its balcony, were salvaged from the Empress Theatre. The Big Secret Theatre, built in 1995 for One Yellow Rabbit Performance Theatre, has a flexible 130- to 246-seat capacity. The 60-seat Motel, opened in 2005, accommodates experimental and emerging artists. In addition to the performance venues, the centre also houses rehearsal halls, theatre workshops, offices, meeting rooms, a café, the CKUA Radio Network and a gift shop. Directors of the arts centre have been Christian Gurney (1985), Douglas Laughlan (October 1985–96), Colin Jackson (1996–2009) and Johann F. Zietsman (beginning in 2009). In 2001, the Calgary Centre for Performing Arts signed a 10-year, $2.6-million contract with the Edmonton-based utility company EPCOR to rename the complex the EPCOR Centre for the Performing Arts. As part of the deal, EPCOR also provided the centre with preferential pricing on gas and electricity. Although EPCOR’s naming rights expired in 2011, the name of the centre was not changed until December 2014, when it was rebranded Arts Commons. Eric Dawson, “Calgary, An Arts Community Fights for a Place to Grow,” Performing Arts in Canada vol. 16 (Spring 1979). Dan Cloutier, "A Centre for Stars to Shine," Calgary Music Interest Digest vol. 1, no. 2 (1984). Brian Brennan, "The Impossible Dream Comes True at Calgary Arts Centre," "Theatres Named to Honour Outstanding Calgarians," and "Woman Power: The Creative Task Force That Gave Girth and Nurture to the Idea," Performing Arts in Canada vol. 22 (Fall 1985). "Calgary Centre for the Performing Arts," Orchestra Canada vol. 12 (September 1985). Frank Tivy, "Dream Pipes," Prelude (14 November 1986). 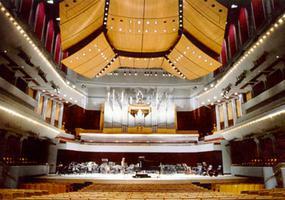 "Calgary's Lavish Cultural Palace had a Successful First Year," Performing Arts in Canada vol. 23 (November 1986). "Organ facts," Prelude vol. 10 (3 March–23 April 1988). Martin Morrow, "Calgary's Centre for the Performing Arts Opened 10 Years Ago. . . ," Calgary Herald (16 September 1995) and "Man on a Mission: Arts Centre Boss . . . ," Calgary Herald (15 September 1996). "Calgary Arts Centre Gets $4-million Boost," The Globe and Mail, 4 May 2001. "EPCOR Adds New Pianos," Calgary Herald (29 September 2006). Kevin Young, "Acoustic Elegance at the Max Bell Theatre," Professional Sound vol. 20, no. 3 (June 2009). Arts CommonsThe website for Arts Commons features the latest news about programs and events. EPCOR Centre takes funding hitRead this March 2014 article from the Calgary Herald about the potential budget shortfall facing the EPCOR Centre.